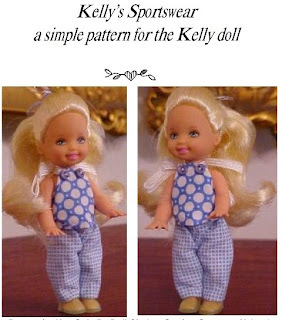 Cute pattern for the Kelly dolls. They are very tiny dolls which make it hard for most sewer's to sew up little outfits. This pattern is very simple, but with trims and coordinating fabrics you can make a really cute wardrobe for your Kelly doll. This is an E-Pattern, so please email me at pamamom@gmail.com if you would like a copy.